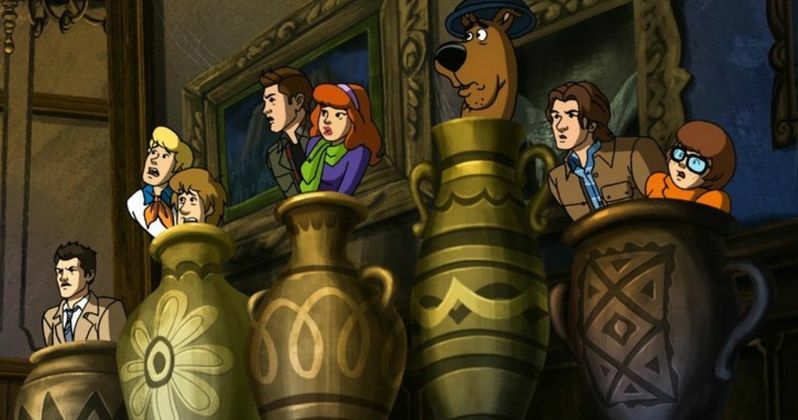 The first images from the Supernatural and Scooby-Doo crossover episode have arrived online. The crossover was first announced last year and, right from the beginning, fans have been very excited about the prospect. Now, some brand new images give us our first real look at the episode, titled Scoobynatural, and it's exactly what you think it's going to be, but in the best way possible. Two of the images are animated, with Dean and Sam joining Scooby-Doo and the Mystery, Inc. gang on what looks like a classic adventure. There's also one live-action photo, which features Dean wearing a classic Fred-esque ascot. So how does this whole Scoobynatural thing happen in the first place? A monster-of-the-week episode sees Dean in a wrestling match with a live dinosaur plush. Following the fight, a pawnshop owner gives the boys a free TV as his way of thanks. They take the TV and, even though Sam resists, Dean uses it to help create his "Dean Cave." As one might expect, not all's what it seems to be with this gift and the pair gets sucked into a Scooby-Doo episode. Here's what co-showrunner Robert Singer has to say about the crossover episode. "Once they get over their amazement at being in the cartoon, two things happen. They say, 'We've been in a situation like this before with the Trickster and I think we're supposed to play this out.' And then they realize they're in a Scooby-Doo cartoon, which makes Dean incredibly excited because Scooby-Doo was his favorite cartoon growing up." This particular mystery that the boys get sucked into is based on the 1970 episode of Scooby-Doo, Where Are You!, titled A Night of Fright Is No Delight. But this isn't going to pan out the same way as Robert Singer adds, "There are things you wouldn't see in a regular Scooby-Doo cartoon." So don't expect the monster to just be some harmless guy in a mask. Dean happens to have extensive knowledge of Scooby-Doo, which will come in handy, as he's able to recognize what episode they're trapped in pretty quickly. Here's what co-showrunner Andrew Dabb has to say about the episode. "It gets pretty dark...They walk into an old episode of Scooby-Doo. But it may end up being a new episode of Supernatural." Season 13 also included a backdoor pilot for a spin-off series, Wayward Sisters, which also has fans excited. But this Scooby-Doo crossover is pretty exciting in its own right. One of the images features Dean holding hands with Daphnee. As Andrew Dabb says, "Dean came of age in a time before the internet when Daphne wasn't so bad. Dean has very strong opinions on all the Scooby characters, but especially Daphne and Fred." Longtime Supernatural executive producer Robert Singer is directing the episode. Scoobynatural airs on The CW on Thursday, March 29. Be sure to check out the new images from the episode, courtesy of Entertainment Weekly, for yourself below.